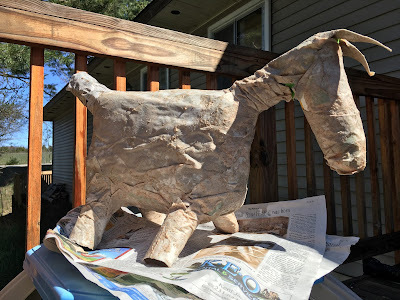 We'll celebrate our daughter's birthday in a week or so, so I'm making a piñata. This could be several animals at once: a dog, a llama, a donkey, a horse. So, it's a dog-llama-donkey-horse. It's drying, and it'll be painted, decorated, and filled with 50%-off Easter candy soon. You better believe this piñata's birth took precedence over more important "things" today. I guess that means it's time to clean the kitchen and brush my teeth.